It’s composed of two VCO (Saw and Saw+PWM), one Envelope Generator (AR, re trig-able), one LFO, one VCF, one VCA and one Noise source. All the elements are internally routed. 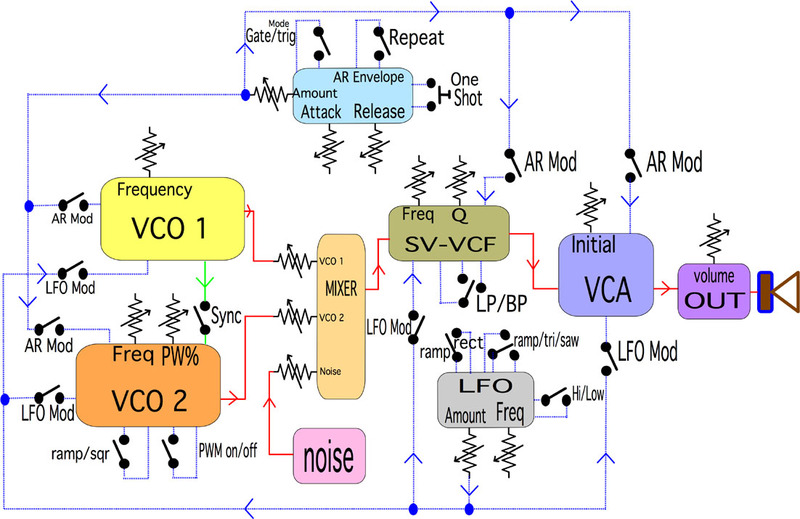 LFO and AR Envelope can modulate (On/Off) all the other elements. See the diagram below for a graphical representation of the internal wiring. You’ll find more details and explanations of the differents circuits, the complete theory of operation, etc. on MFOS website. This is an updated version. You can also read SMT SLMS previous posts. The SMT Edition has been specifically designed to fit in a Eurorack System (Power input: -12, 0, +12 volts) and it removes any extra wiring. It’s a one board solution. 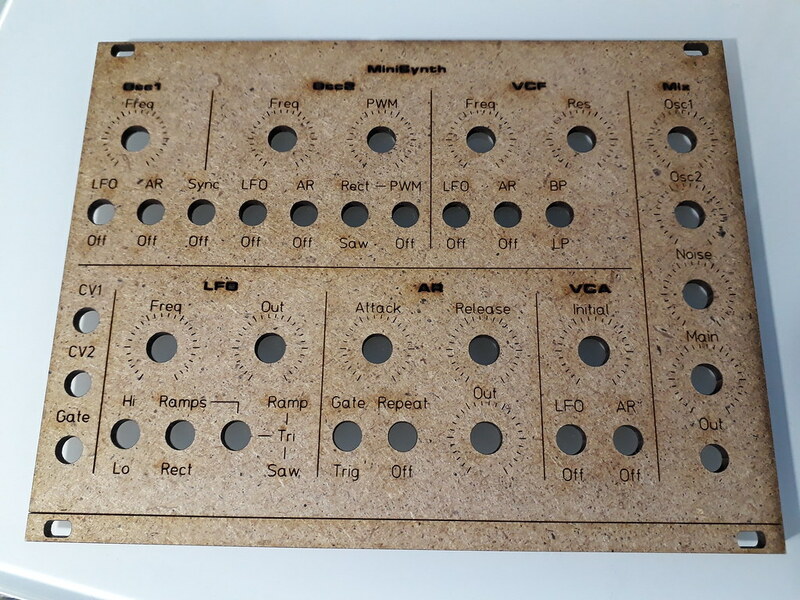 Also, while the original is designed for beginners (with some technical backgrounds), this version is in Surface Mount Technologie (SMT) and thus, requires some experience in soldering such small components. The electric circuit is identical to the original SLMS. Also, it does not include the later optional mods proposed by Ray. I strongly recommend to read the original documentation. Cross reference between the two version is easy: the part references and values are identical. R1 in SMT version is R1 in Ray’s original version, and so on. 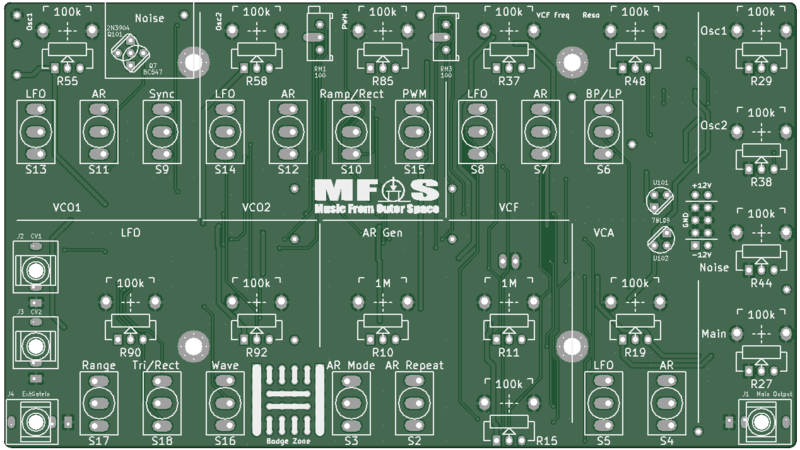 The FET transistors (MPF102) Q5 and Q6 have been replaced by two BF545. The four NPN transistors (2N3904) Q1, Q2, Q3 and Q4 have been replaced by two NPN arrays BC847BS. They are closely matched and remove the need to hand match transistors. 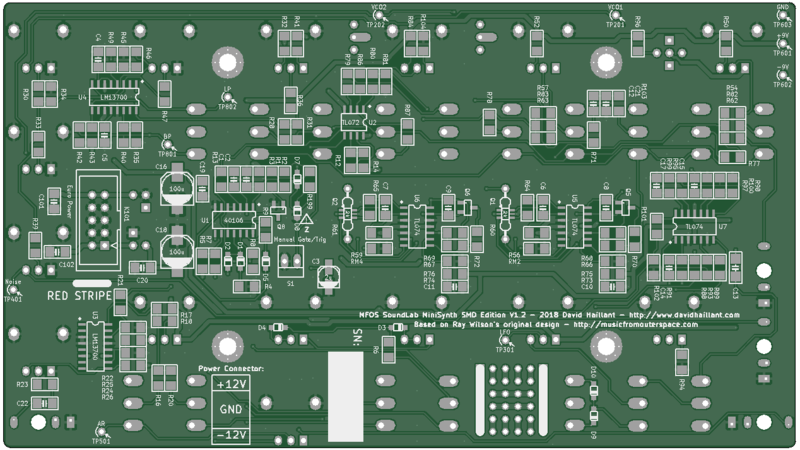 The power input is buffered with two linear regulators 78L09 and 79L09 (U101 and U102). They lower the input voltages from -12 and +12 volts to -9 and +9 volts. 100nF capacitors C101 and C102 provided for stability. The assembly is pretty straight forward. No kludge, bodge, correction, mod or whatever is required to make it works. 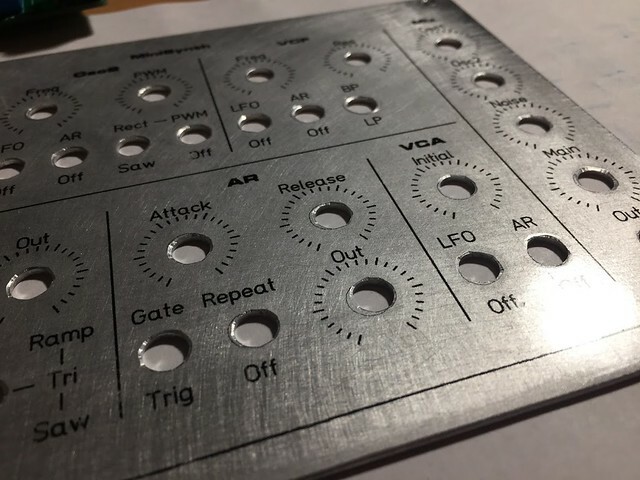 SMT soldering is easier than what it looks like. No need for special tools or special soldering iron or tips. I recommend the use of thin solder wire. 0.3mm is good. 0.5mm is ok.
Get a good pair of fine, non magnetic, tweezers. 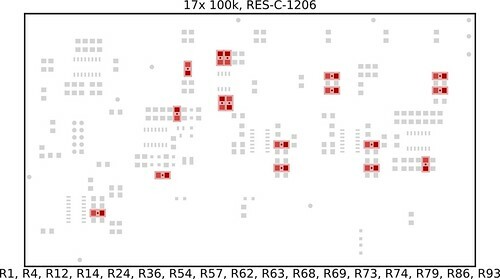 To help you with SMT component placement, I created a Component Map, one page by value, showing in RED where each component goes. Click to download. This document does not represent any sequence for assembly. Only locations. Check also this Interactive Pick and Place Map. 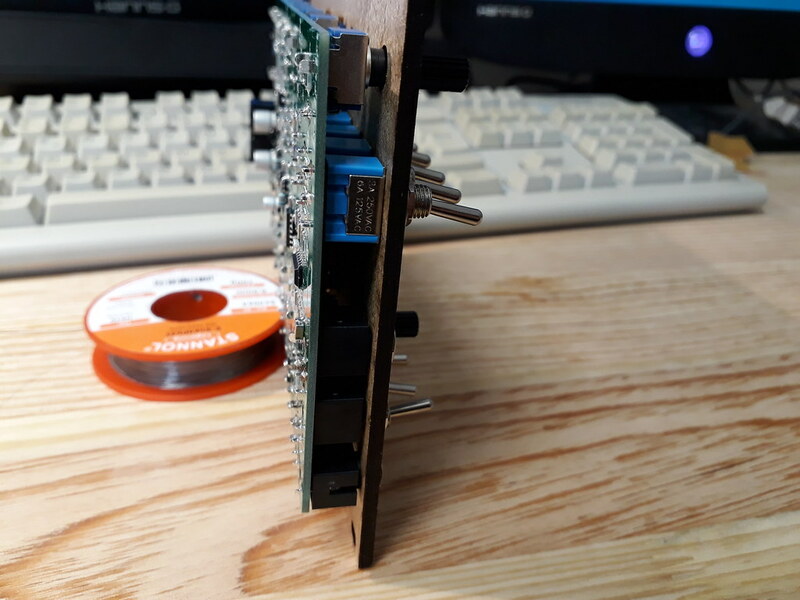 Usually, it’s recommended to start by soldering the smallest parts. Tall components can block you. Start with resistors for example. And start with the largest group of same value resistors, for instance, the 100k group. Then continue with decreasing group sizes. Next step is SOIC packages. The white dot mark on PCB represents pin #1. Continue with SOT transistors and SOD diodes. Prefer SOD 323 over SOD 323F. Attention, D8 is the Zener Diode. The most challenging parts to solder are the two transistor arrays Q1 and Q2 (SOT 363 package). The BC847BS doesn’t have a polarity (the part is in fact symmetrical) so simply focus on pin alignment to the pads. Check for possible shorts between pins. Also, there’s no marking on ceramic caps. Do not mix values! Finish with the aluminum capacitors. Flip your board and solder the two regulators. 78L09 is Q101 and 79L09 is Q102. Continue with either Q7 or Q101. 2N3904 are good Noise sources. Use Q101 for 2N3904 or Q7 for BC547. 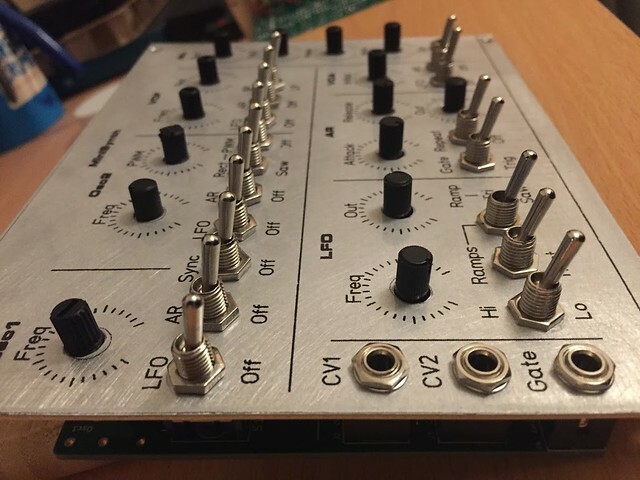 Flip again your board and solder the 10 pin Eurorack Power Connector K101. Now is a good time to solder the (Tempco) resistors R60 and R61. They are mounted on TOP of the Transistor Arrays Q1 and Q2. Place them as close to the arrays as possible. 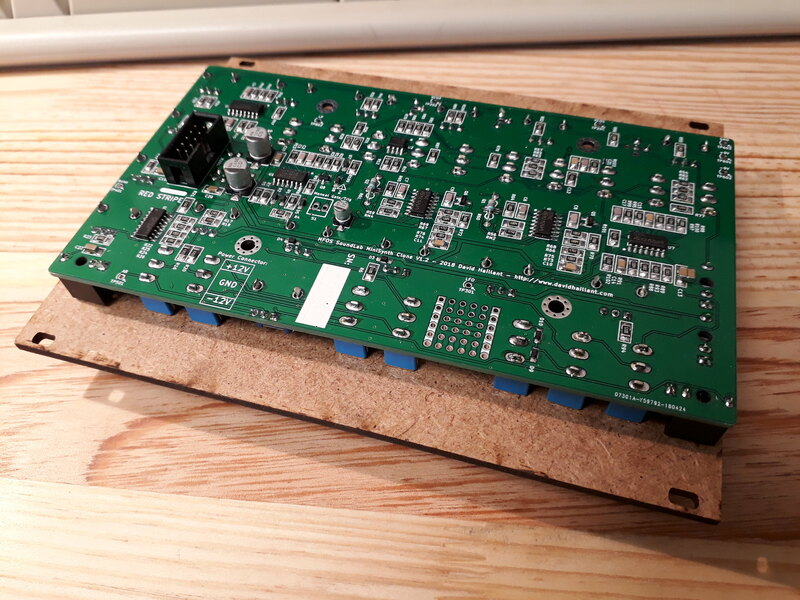 The Bottom side of the board is now complete (connector S1 is optionnal). It’s time to solder the remaining TH components. Starting as usual with the smallest ones. RM1 and RM3 come first. Orient the screw head toward the outside. If you already have the Front Panel, you can use it now. It will help you align correctly the controls. Solder the four jack connectors. Then, the potentiometers. 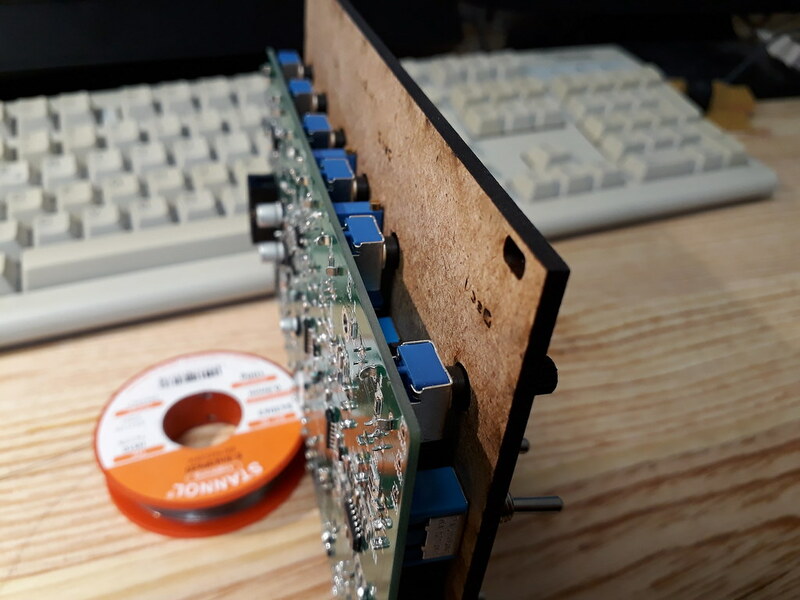 Before soldering them, I highly recommend to remove the protruding tabs with pliers. You might need to remove the nuts and washers. Finally, solder the Switches. Pay attention to S16. It’s the only 3 position switch. If your switches come with 2 washers and 2 nuts, only keep 1 of each. Before plugging in any power source, check twice your job! If there’s a short circuit anywhere on the board, the two regulators will switch off quickly, but some damages can occur nevertheless. Power your board with -12, 0, +12 volts (see “power connector” diagram on the board). Also, a thick white band indicates the -12V rail (usually the “red stripe” on your ribbon cable). You can find the CAD file download link in the Downloads section below. For a complete list of components, suggested sellers and parts, sorted by values, with refs and comments, see Google Calc document or below in Downloads section. There’s also a PDF document showing Component positions and an interactive BOM available. However, it’s possible to use simple 50ppm/°C resistors instead. 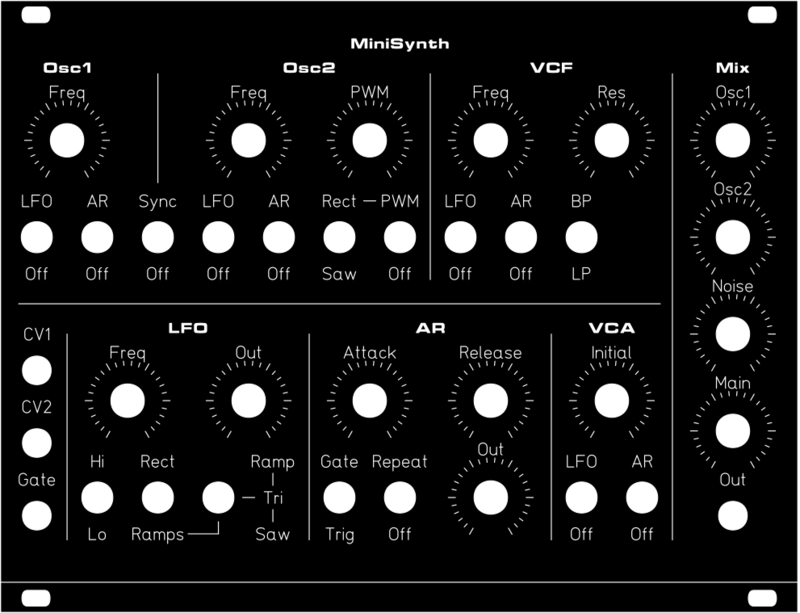 Your VCO will work, track the 1V/octave CV input but will be out of tune as soon as the temperature will change. All switches are SPDT (Single Pole, Double Throw) with the exception of S16, which is a “3 position” SPDT with an additional central position (No Contact). The two Mouser ref should be ok for the job. 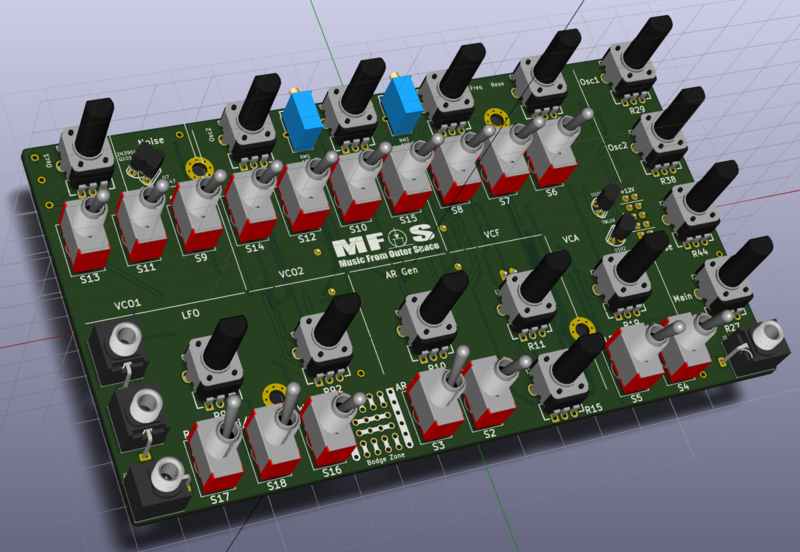 I’m feeling foolish – I can see assembly instructions, BOM etc, but cannot figure out where or how to get hold of the PCB for your implementation of Ray’s MFOS SLM-S.
SLMS is not yet officially released. 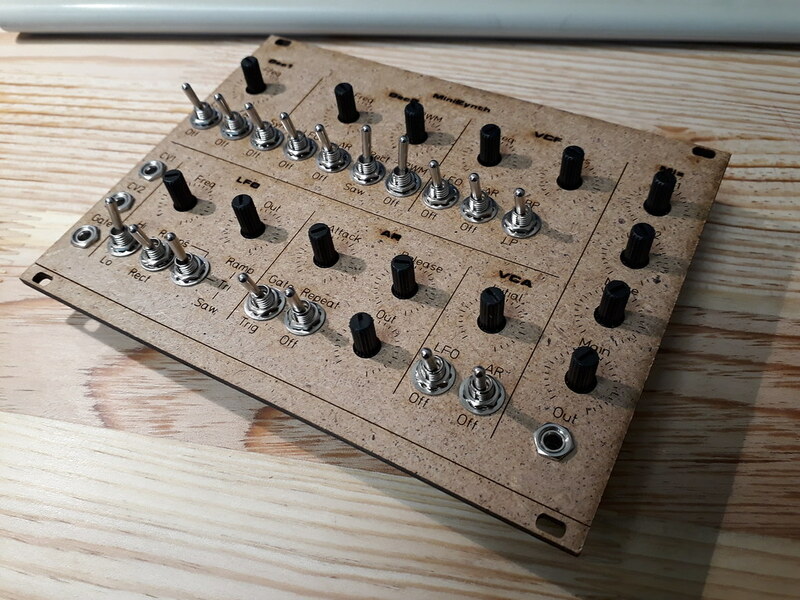 I do have prototypes still available though. Just contact me if interested. 1) LM13700N/NOPB is the DIP version, it should be LM13700M/NOPB-ND for SOIC-16. 2) Not really an error, but 79L09’s are obsolete in TO-92 format. There are substitutes in TO-243 and THT versions. 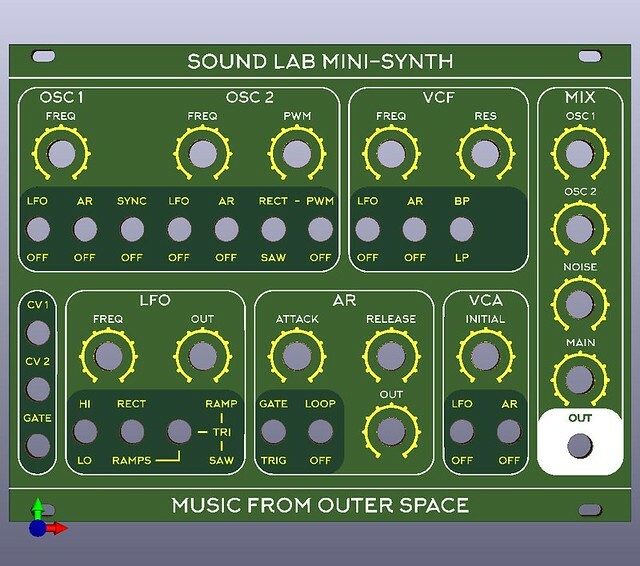 I’ll probably use a THT version, as the pinout looks the same to me. Let me know if I’m not correct here. You’re right, Mouser ref. 926-LM13700MX/NOPB should be fine. 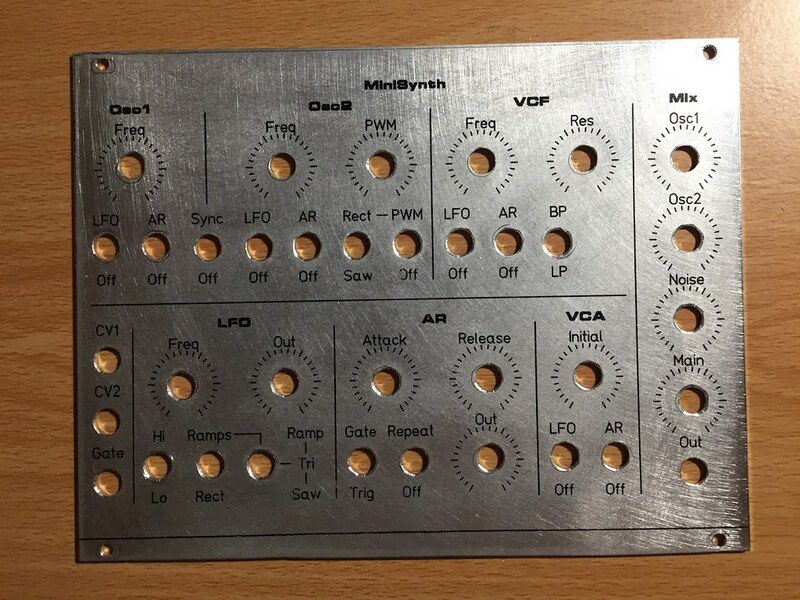 About the 79L09 I’m really confused… I hadn’t noticed it became obsolete! Reichelt in Germany is still selling it, so I wasn’t aware. I have some stock available if it helps. I will try to find a workaround. 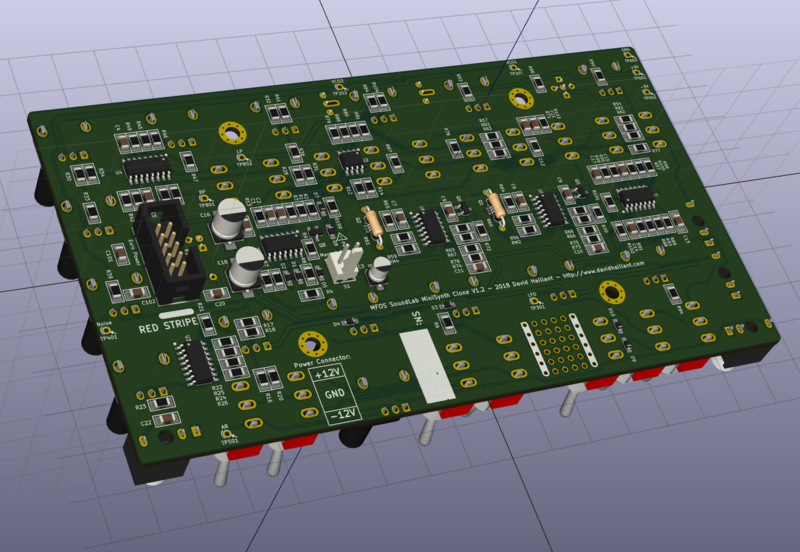 TO-243 package is an interesting alternative, but I need to make a PCB revision for that. I also might create a PCB Mod Board. Anyway, thank you very much for pointing this out!